Ballast not included. Recommended 720 lbs. The Hurricane�s massive extension arm features an upper and lower boom support. The extension distance from base to backboard is 96� meeting all NCAA and National High School Federation requirements. The unit comes equipped with First Team�s top of the line FT235 Unbreakable 42�x72� competition tempered glass backboard, FT196 Full-Tilt� 180� breakaway goal and FT72C TuffGuard� bolt-on backboard padding. These are the same components used in high schools and colleges throughout the country. The Hurricane is also height adjustable. Rim height adjustments from 10� down to 6� are made easily with its �Spring-Aided� design. To adjust, simply pull the pin located on the adjustment rod, raise or lower the unit as needed and replace the pin. One person can easily roll the unit into place and set up quickly and easily. Heavy foam padding, available in an array of colors, protects players on the front, sides and back of the base. The unit is extremely stable as well as durable and will not tip over when players hang on the rim. For additional support, rear hold downs are included as required by the NCAA and NHSF for competition portable goals. Choose the Hurricane Triumph-FL package for installations on floating floors or Hurricane Triumph-ST for all other flooring surfaces. 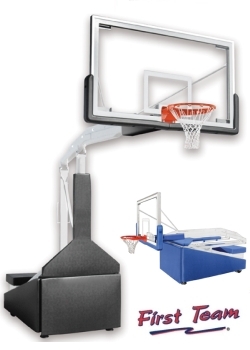 All Hurricane portable basketball goals are covered by First Team�s unmatched Lifetime Superior Warranty! BALLAST NOT INCLUDED: This system requires a recommended 720-850 lbs of ballast.